92kw Arms loaded Highway guardrail drilling all-in-one machine, highway drilling all-in-one machine, also known as screw machine 6105 (8-8 screw machine 8 cubic Screw Air Compressor) is mainly used for highway guardrail drilling, piling, the whole machine structure is reasonable, drilling stability is good, almost no jitter, drilling straight, piling fast. Highway guardrail drilling All-in-one machine is from the traditional loading highway guardrail drilling machine and highway guardrail piling machine, Air Compressor comprehensive upgrade of the highway guardrail new drilling integrated machine equipment, screw Air compressor integrated in the loader, no need to towed, it has a guardrail drilling and guardrail piling two functions, and has a certain ability to pull the pile effect, Realized a multi-use of a machine. 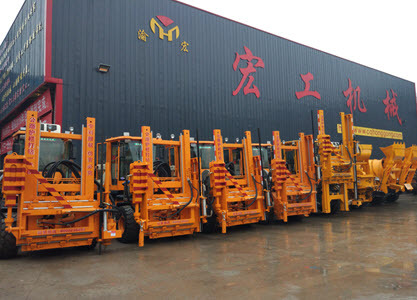 And it in addition to the function and ordinary guardrail piling machine and drilling machine has a certain difference, in the shape also has a certain difference. Chongqing Honggong production of this Chongqing brand loading Highway guardrail drilling all-in-one machine using 92kw six-cylinder diesel engine to provide power, 8 cubic screw air compressor auxiliary pressure, with hydraulic sensing method transmission machinery operation, the machine operation efficiency is high, drilling quality is accurate, energy consumption is small, according to the formation of strong degree of conditioning punching strength and punching drill bit, With very good operating efficiency, with fast drilling speed, straight aperture, piling positioning, fast movement, high precision, life long, fuel-saving environmental protection, is a new type of highway anti-guardrail equipment, its piling efficiency is 1.5 times times the traditional car type piling machine. In all kinds of messy strata of highway guardrail installation operations, screw-type Highway guardrail drilling all-in-one fully reflects its high quality, high efficiency, energy saving, high life, maintenance-free and other characteristics. Hong drilling All-in-one machine is composed of screw air compressor system, hydraulic system, power system and so on. 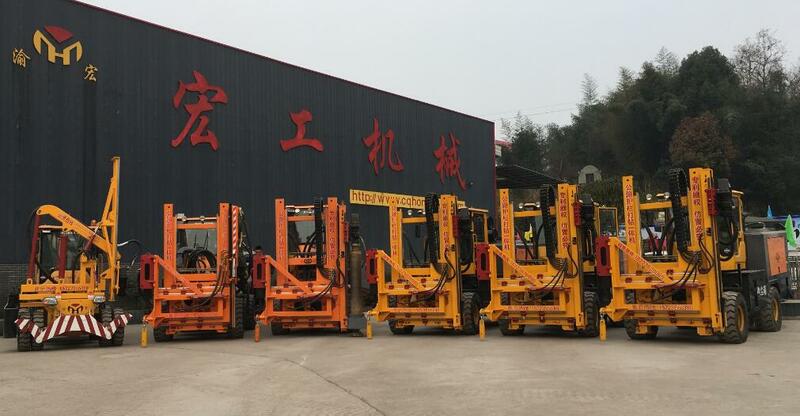 The company according to user needs, reference and absorption of similar models at home and abroad structural characteristics and advanced technology, combined with professional institutions, the development and design of small construction machinery. 12, equipped with drilling positioning and reversing camera, at any time to control the overall road conditions; It has the advantages of reasonable design, compact structure, flexible operation and convenient maintenance. Its performance indicators are in the industry standard. It is widely used in construction engineering drilling, municipal engineering drilling, Highway guardrail drilling, piling, bridge drilling, urban and rural road guardrail drilling, piling, highway guardrail drilling, piling and other industrial and civil construction construction and other places, especially suitable for long-distance highway guardrail installation punching operations, can greatly improve work efficiency. The main parts of this machine are brand-name manufacturers of products, good interchangeability, reliable quality, adequate accessories resources.